Traditionally speaking, web site Mobile Application development had remained solely at intervals the walls of marketing, marketing and a lot of marketing. However, because the client preferences modified, they became a lot of conscious of their own role within the product /services choice ways. The world lies in your pocket. Take your business to the most concise, yet the most effective marketplace of all – a smartphone. Applications, m-commerce, responsive design, interactive applications – you name it, we create it. Website , Ecommerce , Mobile App Design landing pages. Reaching out your customers through modern digital devices including mobiles of different resolutions. In the current era, the rise in the demand for tablets and smartphones has increase significantly, nearly half of all internet users access online content from their mobile devices. Aurus provides extended website design services to include mobile web design ie. 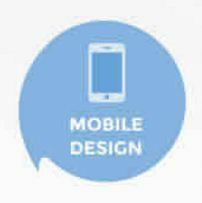 design and development of mobile websites. Our HTML 5 based mobile websites are compatible across several mobile OS including iOS, Android, BB and Windows Mobile platforms. We believe mobile technologies is more present than future and our approach extends from mobile to overall digital platform.